President Donald Trump’s team of top advisers is expected to remain bare bones after Congress returns, raising questions about the administration’s ability to achieve an ambitious overhaul of the U.S. tax code, reshape the budget, and change the regulatory landscape. The Senate returns to work April 24, but the prospects for the chamber to approve more than a handful of the administration’s key officers soon is sharply limited by Trump being slow to name his nominees and officially transmit them to Capitol Hill for consideration, experts said. Senate Majority Leader Mitch McConnell (R-Ky.) has only seven of Trump’s nominees ready for floor votes while another 22 still are awaiting votes in committee. Two of those seven still awaiting confirmation as Trump nears his 100th day in office are Cabinet nominees. Sonny Perdue was chosen by Trump in January to head the Agriculture Department. His nomination is set for a vote soon after lawmakers return. But McConnell has yet to announce when the Senate will consider the Alexander Acosta nomination for labor secretary. He was chosen in March, after Andrew Puzder bowed out. Trump earlier blamed Democrats for the slow pace in approving his Cabinet, but even Republicans said after the last of his picks was approved that there was no more they could do without the administration forwarding more nominees. The White House formally transmitted Perdue’s nomination more than six weeks after Trump announced the choice. So far, only 25 nominees for civilian posts in the government have been confirmed. The slow pace in finalizing the roster of Cabinet officers and their deputies is expected to is said to be likely to make it harder for Trump to pursue his legislative priorities and also make it more difficult for the federal agencies to respond quickly to developments. In particular, the delays mean there will be fewer top Trump officials to testify on the administration’s proposed tax changes and fiscal year 2018 budget. It isn’t unusual for a new president to take a year to get a full team in place, Max Stier, president and chief executive officer of the Partnership for Public Service, told Bloomberg BNA. But, he said, Trump’s record is falling behind those of his predecessors. “This president is going even slower than the historical norm, and that’s highly problematic because there are people in the jobs but they are in acting positions and are not as equipped as a presidentially nominated and Senate-confirmed individual would be to handle tricky situations and to take a long-term perspective,” Stier said. The first batch of Trump nominees—most for national security positions including the heads of the departments of Defense, State, and Homeland Security—were quickly confirmed after his inauguration. But the process bogged down amid concerns that many other Trump choices weren’t fully vetted and had not met their financial disclosure requirements before being considered in committee. Democrats forced other delays by staging all-night debates to protest nominees’ backgrounds and philosophies. However, every nominee put to a vote was confirmed. McConnell used a rules change Democrats made to allow confirmations by simple majorities. Work in processing subsequent nominees slowed for other reasons. Senate Republican Conference Chairman John Thune (R-S.D. ), third in the Senate GOP’s leadership ranks, said it was “the great secret of the universe” why it took Perdue’s nomination to head agriculture so long to be transmitted. His nomination was finally reported from committee March 30—the same day that Acosta’s was reported to the floor. Action on those two nominees by sometime in May will mark the completion of the Cabinet. But Stier said there are actually 4,000 political appointments an administration makes, with 1,100 of them subject to Senate confirmation. Even if only half of the latter get the most attention of the new administration and Congress, it will be a long time before the key slots at the agencies are filled, he said. Stier’s organization is tracking 554 of the appointments. The process also is carefully monitored by the White House Transition Project, which reported that Trump’s appointments lag behind previous administrations by five weeks. “On track for worst performance in four decades over the 100 days on nominations, confirmations, pace of White House processing, length of Senate deliberations, and critical leadership stand up,” it said. After the Cabinet, a key task for the Senate will be to confirm Trump’s roster of deputy secretaries—officials who Stier said often are de facto chief operating officers at the agencies. So far, the Senate confirmed only one of these—Elaine Duke to serve as Homeland Security deputy—but two others could be confirmed soon. McConnell and Senate Minority Leader Charles Schumer (D-N.Y.) locked in an agreement to vote soon on the nomination of Rod Rosenstein to be deputy attorney general at the DOJ. Also awaiting action on the Senate’s Executive Calendar is Jeffrey Rosen to be deputy at the Transportation Department. The nominations of three others—Eric Hargan for the Department of Health and Human Services and Althea Coetzee for the Small Business Administration—are pending in committee. Meanwhile, Todd Ricketts announced April 19 that he was withdrawing his name from consideration for deputy secretary of the Commerce Department. His nomination had been pending since Jan. 20. The nominations of others such as Jim Donovan, Trump’s pick to serve as deputy at the Treasury—have yet to be transmitted to the Senate. Sarah Binder, a senior fellow in governance studies at the Brookings Institution, said Trump’s failure to get a team in place at Treasury is particularly of concern because Trump is set to accelerate efforts this spring to overhaul the tax code. At this point, she said much of the administration’s tax policy appears to be driven by Gary Cohn, the former Goldman Sachs official whom Trump named to be director of the White House National Economic Council. Binder, also a professor of political science at The George Washington University in Washington, said it also isn’t clear how much the Trump White House is coordinating the effort to get its team in place and pursue a tax overhaul with Republicans on Capitol Hill. The White House transmitted two nominees for Treasury posts—Sigal Mandelker and David Malpass to serve as under secretaries—shortly before the start of the congressional recess, and hearings on them are expected during the next month. But Trump still has to transmit the nominations of Donovan and many others, including Brent McIntosh to be general counsel at the Treasury and Adam Lerrick to be deputy undersecretary for international finance. While nominees for Senate-confirmed positions lag, Trump sent unofficial “beachhead teams” early on to federal agencies. Members of those teams—which Stier said exceeded 500—are said to function as Trump’s “eyes and ears” in the agencies. Many of them are drawn from the Trump campaign and the lobbying community. Lisa Gilbert, vice president of legislative affairs at Public Citizen, said such teams originated with Mitt Romney during his presidential campaign and then were used by President Barack Obama. Gilbert said there is “absolutely nothing wrong” with such teams operating in the first months of a new administration. But there is concern about them staying long term amid a drawn-out confirmation process, she said. 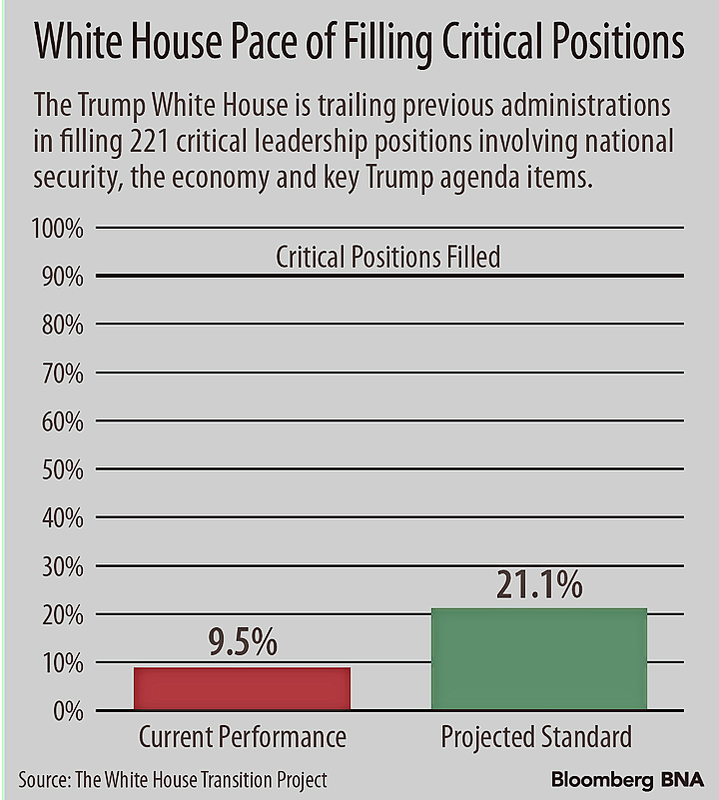 But Stier said he’s convinced that the White House won’t want to rely on these teams or on acting officials, who are primarily career people, for long. “It will also be potentially troubling when—and I mean when, not just if—we have a crisis because, again, these people are often extremely capable but they’re not trusted in the same way as a Trump appointee would be, and they are, because of the relationship, not invested in the same way as someone who has been named and confirmed by the Senate,” Stier said. The pace of confirmations—which Gilbert described as “slow, laborious, and fraught with conflicts of interest”—may reflect two trends: more centralization of authority at the White House and a diminished role for the Senate. “The purpose of the confirmation process is to bring things to light—financial conflicts and positions that the Senate might not approve of—and it’s an important check on the power of the executive,” Gilbert said. Binder said Trump himself in an early interview questioned the need for large numbers of official appointees. She suggested there is a conflict between Trump and his inner circle who question the need for a government apparatus and other Republicans—some of them “Never Trumpers” during the campaign—with governing experience. Trump’s move to give broad responsibilities to his son-in-law Jared Kushner, NEC’s Cohn, and national security adviser H.R. McMaster signals that the president may want to run much of the process out of the White House, Binder said. “There’s certainly been a centralization of power within the White House, but most presidents also make an effort to build out their political teams within each of these agencies and departments and it wouldn’t just be secretaries but deputies and staff,” Binder said. As the year wears on, Binder said, the Senate’s attention increasingly will shift to legislative matters.